Word on the street is that mustard yellow is the new millennial pink. I don't know if I totally agree with that—yellow can be a polarizing color, and it's one that can be tricky to get right, plus it might just be a fleeting trend rather than a generational thing. So in the name of investigative journalism, I decided to give it a try. This top is my first-ever purchase from Sézane, the up-and-coming French brand that will be hitting select Nordstrom stores this month. My top also comes in white and red, and while I was totally tempted to buy the white, I have way too many white lacy tops, and, um, I may have purchased a different style in white. Anyway, I was still on the fence about it—I even left the tags on throughout this shoot—but as the night wore on, I decided it's a keeper. First of all, the lace is gorgeous and runs along the entire sleeve; the fabric is really soft and airy too (it's linen, I believe). The color is definitely outside of my comfort zone, but the more I look at it, the more I like it. Styling this color presented a bit of a challenge, however! I tried a khaki trench coat and a denim jacket before settling on this knit blazer (last seen here). I feel like the boho quality of the top needed something more polished to balance it out. Plus, it was kind of chilly when we shot this—where is spring, again? The top has an interesting, kind of boxy cut, so I paired it with these cropped bootcut jeans from Madewell (last seen here) that have a higher waist. These jeans are so stretchy and forgiving, they look great with nearly everything. 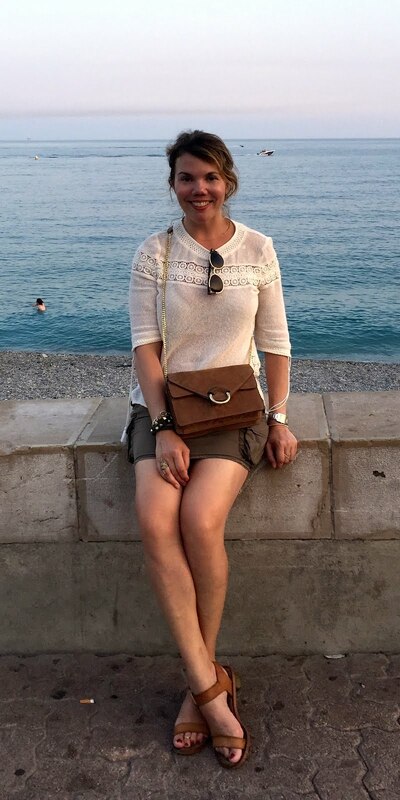 Since Sézane is a Parisian brand, I decided to go all-French with my accessories. I recently added this double-tour bracelet to my Hermès collection (happy birthday to me! ), and I'm carrying my beloved Jerome Dreyfuss bag (last seen here). And, of course, my vintage Chanel shoes. They're one of the highest-heeled pairs I own, but, believe it or not, they're also quite comfortable. You get what you pay for, folks. 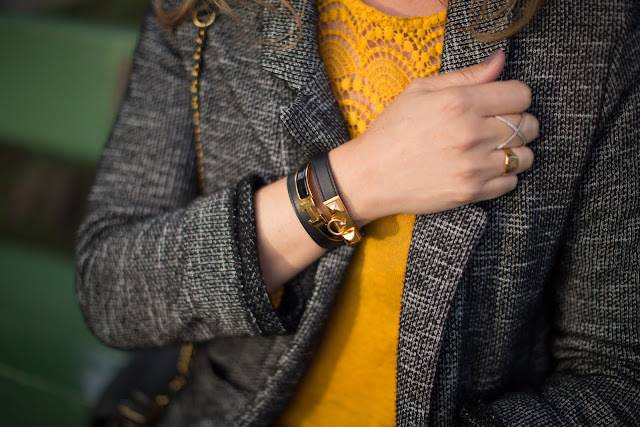 I love pairing mustard with grey! They look so good together! Love your new bracelet! I love how you styled the top! The cardigan with it looks so cute. I love this mustard yellow top on you! You look gorgeous. You wear yellow well! I have a hard time with yellow, it has to be just the right shade, but I'm sure that's an issue for most people. This outfit is chic! I have one mustard yellow top in my wardrobe and have been surprised at how much it goes with. So cute! I'm drooling over your vintage Chanel! Mustard yellow looks SO good on you! That shade of yellow looks gorgeous on you. I just bought my first yellow top and it took so long because I feel yellow can be a bit tricky to wear. I do love your whole outfit and that Chanel is fab! I love the detail on your mustard top. Great color! Your jeans look great too and I will have to check out the Sezanne brand. Those shoes are beautiful! Lovely top and matching shoes Cheryl :) Great look. Thanks for linking up to The Wednesday Blog Hop. Hope you can join me tomorrow. Hi Cheryl! 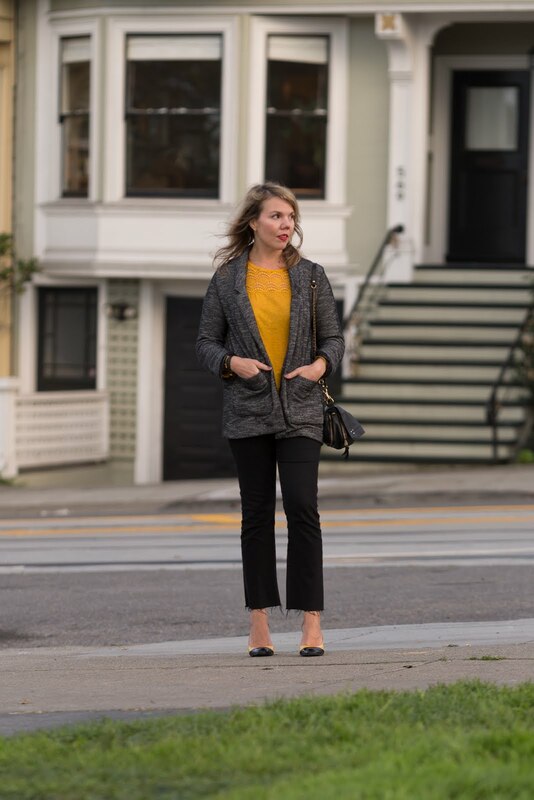 I'm stopping by from The Blended Blog to say how much I love how you paired the mustard blouse with the gray. I totally agree that yellow is hard to style. I prefer a more sunny yellow than mustard because of my skin tone. Those shoes are such a lucky find to pair with this outfit! Hope you're having a great weekend! Such a chic and elegant outfit! I love the colour of the top, and those shoes are stunning! Thanks for linking up! Very pretty blouse! I really like the color and beautiful lace yoke. 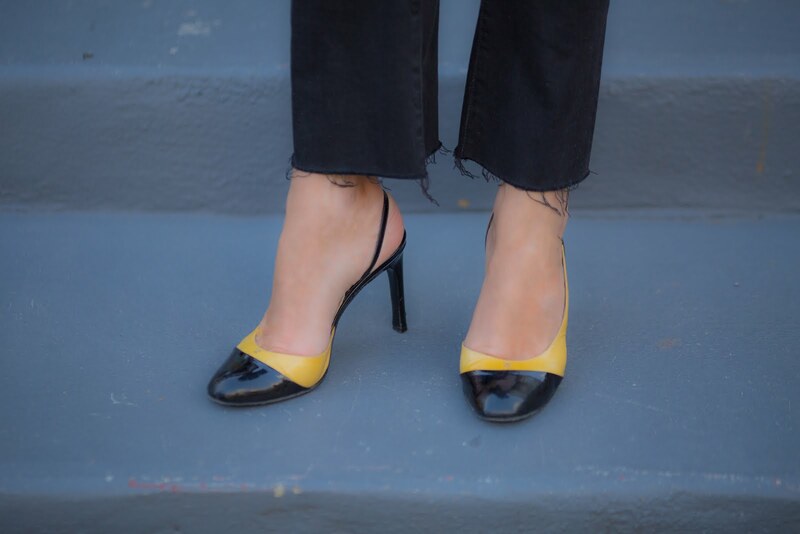 Your shoes are simply gorgeous and look so fab with the raw hem pants! Thanks for linking up with Fabulous Friday, Cheryl!